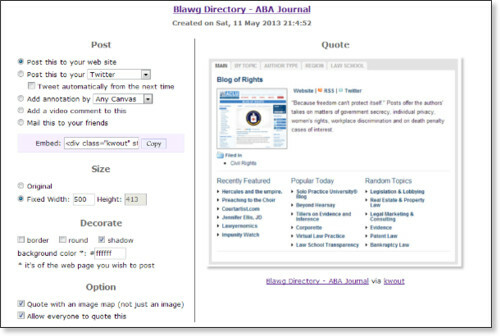 Below is a screenshot I grabbed from the ABA Journal Blawg Directory. At first glance, it looks like a typical screenshot. But something is different — the hyperlinks are all live. Go ahead, click on one. Do you want to use the same screenshot? Click on the kwout name beneath the screenshot and you’ll go to a page that gives you the embed code (or lets you post it to Twitter or email it). This is done via a tool called kwout (pronounced like “quote.”) It operates via a bookmarklet you add to your browser’s toolbar. 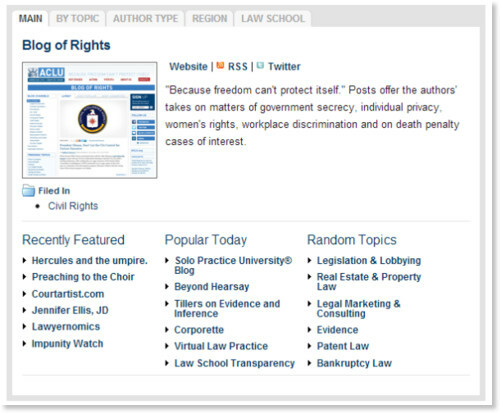 Better than the bookmarklet are kwout’s Firefox add-on or Google Chrome extension. These let you grab (or “quote”) any part of a web page quickly and easily. You choose the portion of the page you want by dragging your mouse. After you’ve grabbed the part of a page you want, you’re taken back to a kwout page (see below) that lets you set the embed size, add a border or shadow, and change the background color. Rather than embed the screenshot, you can also choose to email it or post it to to Twitter, Facebook, Evernote, and various other sites. You can also add an annotation or add a video or audio comment. There are plenty of other screen capture tools out there, of course. But while most capture only a static image, Kwout creates an image map, retaining the active hyperlinks. This makes it a great tool for embedding screenshots on blogs and web pages.